This is the eighth installment of a project that is likely to extend over a two-year-period from January, 2010. 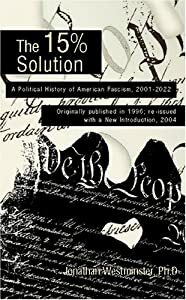 It is the serialization of a book entitled The 15% Solution: A Political History of American Fascism, 2001-2022. Under the pseudonym Jonathan Westminster, it is purportedly published in the year 2048 on the 25th Anniversary of the Restoration of Constitutional Democracy in the Re-United States. It was actually published in 1996 by the Thomas Jefferson Press, located in Port Jefferson, NY. The copyright is held by the Press. Herein you will find Chapter 7. You can find a complete archive of the chapters published to date on TPJmagazine.us as well as the Disclaimer, the cast of characters, the author’s biography, cover copy, and several favorable reviews.